The yield of cucumbers depends on many factors. For example, from where you grow them, from resistance of vegetables to diseases, climatic conditions of the region. Breeders are constantly working on breeding new crop varieties and have already received quite a lot of plants that successfully produce fruit, even in not the most favorable conditions. Among the most productive varieties for protected cultivation it is possible to note "F1 Pinocchio". This is an early hybrid, very productive. In early summer you will be able to taste the first cucumbers. The fruit is of medium length (up to 8 cm). Suitable for salads and for pickling and marinating. Give a large harvest of cucumbers varieties Zozulia, fruit long 20 to 30 cm in length. Very fragrant, so perfect for salads and hash. From one Bush you can shoot up to 7 kg of cucumber. Stable yield hybrids "Courage F1". Is a cucumber fruit type, ie it can form up to 10 of the ovaries in one sinus. Fruits are smooth, medium-length — 12-15 cm Plant suitable for cultivation in greenhouses and in open ground. Cold-resistant and shade-tolerant hybrid "emerald stream F1" . This cucumber salad type fruits constantly and quite long period, so you will be guaranteed provided harvest throughout the season. Outdoors the harvest is considered to be proven, not one generation of gardeners to sort of "Altai early 166". Cucumber early. 40 days after germination, you can first try flavored pickles. Up to 10-12 kg per 1 square meter. This crop gives the sort of "Nugget". The fruit is not very large, but a lot of them on the same plant. Side lashes cucumber generates not very much, so Bush can not forming, which is very convenient for busy gardeners. Very tasty pickles hybrid "Lastochka F1". The plant is very resistant to powdery mildew, so a sustainable harvest is guaranteed. However, the yield is considerably reduced in the Northern areas and in Siberia. Universal fruit varieties, "Farmer", they are suitable for salads and for marinating and salting. 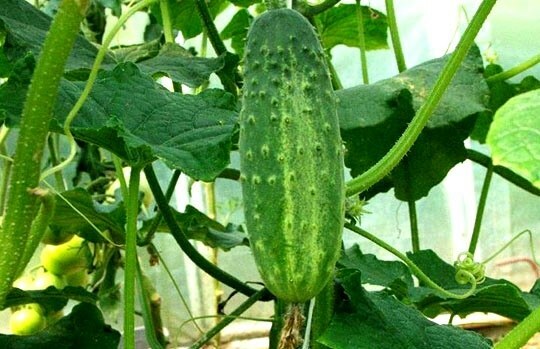 But the most important quality of this cucumber — it yields, under favorable conditions, the plant gives up to 12-14 kg per 1 square meter of planting. However, the variety is late-ripening, so the fruit appear only after 2 months after the first germination. Great hybrid for open and closed ground - "Masha F1". The plant is self-pollinated, mainly female type of flowers. At the same time on the same node can be tied to 7 fruits, with "Masha" excellent taste, young fruits do not taste bitter and they are suitable for fresh consumption and for pickling and salting. To obtain a guaranteed harvest, plant several varieties and hybrids of cucumbers in one flower bed, greenhouse or in a greenhouse.